Two fascinating and informative books by author and historical researcher David Renno. The waters between Rye and Newhaven are situated in the narrowest section of the English Channel, one of the busiest shipping lanes in the world. In fact it was reported that on 20th December 1848 about 1000 vessels were seen to pass off Hastings. Therefore it comes as no suprise that with this amount of shipping there were many collisions between vessels, which became ever more severe with the advent of steam driven, iron built ships in the second half of the century. However,most vessels became wrecks due to navigational error or the poor weather conditions. The reporting of these mishaps during the majojrity of this period was only possible when members of the crew were saved or a vessel failed to arrive at its destination. Therefore, reports of sea disasters were often not made until days or weeks after the event, unless there were others involved in any rescue attempt. In these cases the rescue was invariably within coastal waters such as those recorded within in the authors two books, "East Sussex Shipwrecks of the 19th Century (Pevensey-Hastings-Rye)" and "Beachy Head Shipwrecks of the 19th century (Pevensey-Eastbourne-Newhaven)". Within the two books, some 500 shipwrecks are documented in chronological order of loss, detailing all the known features of each vessel together with the known circumstances of their loss researched in the main from newspaper reports of the day. As well as shipwreck details there is information on types of rigging, Martello Towers, Coastguard and Lifeboat stations, and the Lights and caves of Beachy Head. This pair of books contain the most comprehensive list and catalogue of accounts recorded at the time of events in the 1800's. As such they form an invaluable work of reference for anyone interested in the history of merchant shipping, from marine archaeologists to historians and amateur divers. 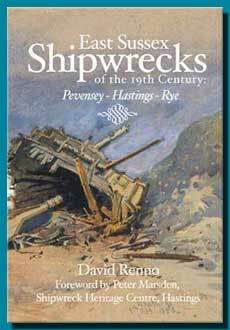 David's first book 'East Sussex Shipwrecks of the 19th Century (Pevensey - Hastings - Rye)' was published in August 2002 and is available to purchase from this site. 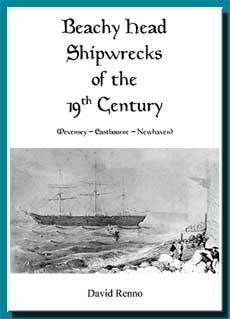 His second book 'Beachy Head Shipwrecks of the 19th Century (Pevensey - Eastbourne - Newhaven)' was published on 8th April 2004 and is also available to purchase from this site.